Greetings! Would greatly appreciate any info on this plate and its mark on the base. Seems newish to me but the fish motif is older I think. Thanks much! 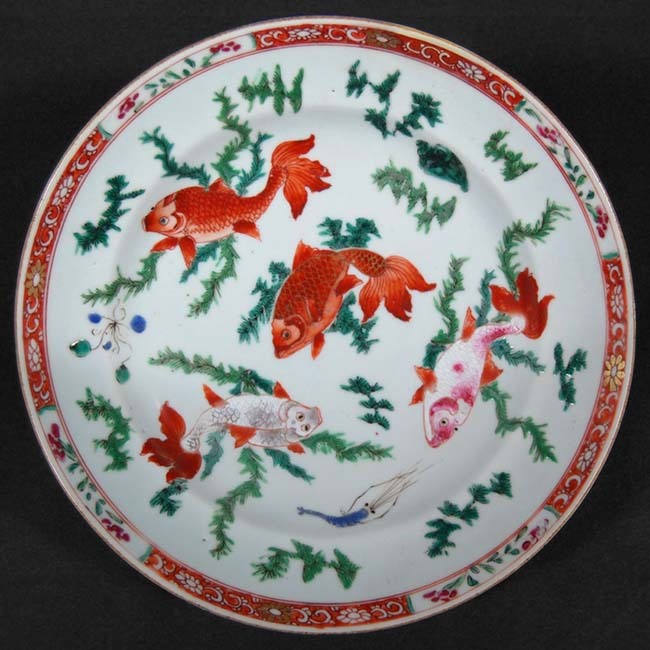 Looks to be another Japanese dish, probably a contemporary piece paying a bit of homage to "wucai" (five color) fish amidst waterweed patterns of the Kangxi era (1662-1722). An example of the latter style is shown below. The base-mark appears to be "庫" (on its right side as shown), which literally is a "treasury" or "storehouse". It has a transliteration of "kura" in that meaning, but wait for the Japanese experts to weigh in on whether it might be something else here. Although Bill is right with the translation of the Kanji character as Kura in native Japanese reading, the Sino Japanese reading is Ko. This might be a very modern mark of the Kozan Gama, founded in 1971 (Kozangama) and a house brand of the Maebata China Corporation, Tajimi City (Gifu). In that case it's Mino Yaki (ware). However, I'm not 100% sure, because I could not found another such mark and this Kozan Gama has a mark that looks normally like the picture included. Thank you Martin! I like the plate a lot.